Mick and Linda Fox firmly believe in hiring and keeping the best as part of the Fox team and family. They know that a solid and dedicated staff together with exceptional workmanship are at the core of their success. The Fox senior management team brings over 90 years of combined experience in landscape services and construction to every project. What started as as weekend job at his grandfather’s retail nursery has become a 35 year career in landscape construction. His eye for detail and perfectionism apparent, Mick graduated from watering plants to the position of landscaper before starting Fox Landscape & Irrigation with his wife Linda over 30 years ago. Raised in San Diego, Brian graduated Cal Poly San Luis Obispo obtaining his degree in Construction Management. While in college, Brian participated on a winning Design/Build team and then winning the coveted “Cap Stone” project where Brian was chosen to fly to Butte Montana and present the winning project to the community. Brian is a licensed General Contractor and certified in Storm Water Pollution Prevention. John is one of Fox’s longest standing employees with over 27 years of dedicated service. He has been in the landscape industry for 30 years and holds a Qualified Applicator Certificate from the Department of Pesticide Regulation. Born and raised in the Bay Area, he graduated the College of San Mateo in 1984, and is married with two children. 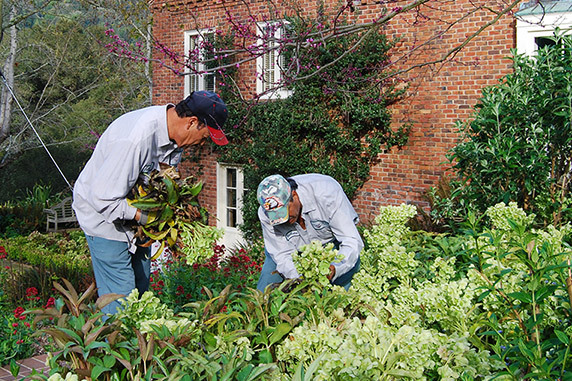 Jodi has over 20 years experience gardening in the Bay Area. She specialises in estate gardens, maintaining vegetable beds and designing flower pots. Israel joined the Fox Landscape team in 2017 and quickly propelled to the role of Maintenance supervisor. Israel’s expertise in irrigation system management has been instrumental in irrigation upgrades and modifications to existing gardens along with strategic irrigation planning for new construction projects. Having worked with a discerning clientele for over 30 years, we know that while you are looking for perfect execution and results, your privacy and security are critical concerns as well. With this in mind, the crew brought to your job, or that regularly services your property, is comprised of highly skilled, fully insured employees, many of whom have been with us for over 20 years. We truly pride ourselves on the level of craftsmanship, care and discretion that are the hallmark of Fox Landscape and Irrigation.